GitHub - paramaggarwal/teddy: A physical pet made possible using Estimote beacons, for Mobstac's Bangalore hackday. A physical pet made possible using Estimote beacons, for Mobstac's Bangalore hackday. Want to be notified of new releases in paramaggarwal/teddy? Don't you love teddy bears? We do. But we thought about what a teddy bear can be in 2014. You'll fall in love with Teddy. It remembers whom it met, and where it has been. It also tells you if you are not keeping him happy. Forget to take him along? He'll make sure he lets you know. The idea is that Teddy uses a beacon which anybody with the Teddy app can sense. So when you are near friends, Teddy 'sees' other Teddy's. Meet often? It will become friends. The app is your interface to your Teddy. You'll know everything he knows. Take him to different places and earn check-in points. Make new Teddy friends by meeting them often and unlock achievements! 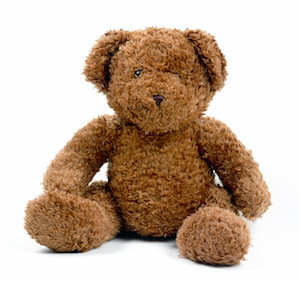 Teddy ages and keeps score, so the more you love it, the more valuable it becomes! Also because it knows other Teddys in the room, you can say hi to them on your behalf! Their owners are notified on their phones. Let Teddy help you make new friends! We think this is a new age of toys, and incredibly excited about the possibilities. Towards the above idea, we have some technical ideas to prove that some of the things we talk about are actually possible with very little code. This repository contains the results of these experiments. The app starts with your Teddy. After you login, it shows you what your Teddy is thinking. If you are away from your Teddy, then it will make sure you know! Technically we prove here that we are able to detect proximity to your Teddy. If one of your friends comes nearby, it says hi! Here we prove that we are able to constantly keep track of other Teddys in the vicinity and act accordingly. If you are heading out and are about to forget to bring your Teddy along, it lets you know. Remember, the idea is that the more places Teddy goes, the more points it accumulates. Or if you are saying good bye to a friend with another Teddy, then it says bye too! Also, you can look around which other Teddy's are there. The idea is you can see more about them, for example what countries they have been to and say hi! Purely a technical demo here. Big thanks to Mobstac for sponsoring an incredible hackday in Bangalore. We got Estimote beacons to hack on and also take home. Check out their platform Beaconstac to quickly build applications using beacons. This hackday was the first ever beacon hackday in India, and we were proud to get a chance to be part of it. Teddy is available under the GNU GPL v2 license.